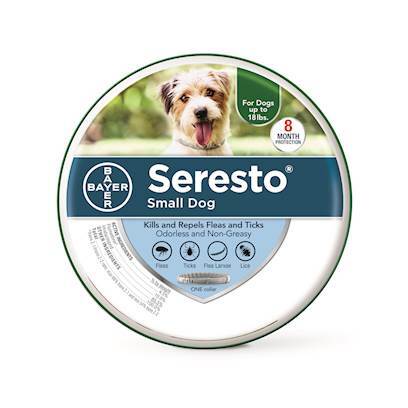 Thanks to their new sustained release technology, Seresto manages to give you all the protection you would expect from a topical treatment, with the convenience you love from a collar. Promising a whopping 8 months of uninterrupted protection, Seresto has revolutionized how the world views preventative flea and tick medication. Non-greasy, odorless, and easy to use, Seresto uses imidacloprid and flumethrin to best protect your dog. This product is restricted from being shipped to Puerto Rico. Read entire label before use. Keep out of reach of children. Do not let children play with this collar or reflectors. To put the collar on, simply remove the collar from its protective bag right before putting it on. Unravel the collar and check to make sure no left over bits of plastic are still on the collar. Insert the end of the collar through the buckle and gently tighten it around your dogs neck, making sure to leave approx. two fingers width of breathing room between the collar and your dog. Cut off any excess collar that is extending beyond the loop. After putting on the collar, you can clip on up to three reflectors to help increase your dogs visibility at night.